ETI0001-1450 does not require a separate PDU since the PDUfunctions are already integrated into the UPS module. This saves rack space,cabling and expense while improving overall reliability. The heavy-duty chassis occupies only4U (7”) for the electronics module and 2U (3.5") for the battery module ofrack space by an ultra shallow 12" deep. Therounded metal corners and rugged handles, both front and rear, aid in safehandling. Internally, all major components are well secured and electricallyinsulated to prevent damage due to shock and vibration. The internal shieldedinput transformer provides galvanic isolation with provisions for domestic (115 VAC, CONUS) and optional international (230 VAC, OCONUS) inputvoltages. 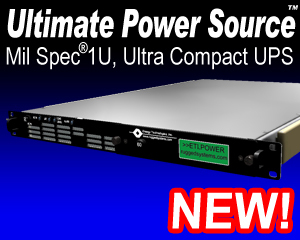 Theunit also operates as a frequency converter, taking 46-70 hertz input and converting it to 60 hertz power. Special EMI/RFI filters and input power factor correction minimize both input current and harmonics. The inputcircuit breaker and the galvanic isolation transformerall provide a double pole isolated source for all installations including shipboard systems oroverseas locations where phase references and grounding are not consistent. ETI0001-1450" also has a remote shutdown interface andan auxiliary DC output. The PDU Remote Control connector provides aninterface to standard or optional remote display/control panels.